What is the best air purifier for mold and microbes? Our expert research team has found that many quality air purifiers are effective at removing airborne mold from an indoor environment. In addition to meeting our standard ratings criteria, we recommend the following air purifiers for mold as they feature Silver Ion technology that inhibits the growth of collected mold spores on the filter. Expert Review The BreatheSmart Antimicrobial Air Purifier pack includes a HEPA-Silver filter with Silver-Ion threads for protection from harmful bacteria and microbe growth. A smaller, more compact version of the Breathesmart, the BreatheSmart FIT50 takes quiet operation to a whole new level with its smart technology. Made in America and all metal construction make the AustinAir Healthmate a high quality machine. High airflow, high filtration efficiency, and large volume of activated carbon make it an excellent air purifier. Vornado’s patented silverscreen technology uses Photo-Catalytic Oxidation (PCO) to destroy contaminants, and a UV light kills bacteria and viruses. Silver-Ion threads are woven into the Alen T500's Antimicrobial HEPA-Silver filter for protection from harmful bacteria and microbe growth. Mold issues are a common problem, and one of the most popular concerns customers bring to our product experts. While most people are familiar with seasonal allergy problems, many do not realize how mold in their homes or offices can be contributing to their asthma problems, allergy symptoms, and poor health. The questions below explore mold issues and solutions, including the role of air purifiers. Mold is a real issue that can cause health problems. The right air purifier can help. In the table above, we’ve reviewed which air purifier units from top brands, like Alen, Austin Air and Vornado, best address mold problems. Many people suspect that mold in their homes may be causing their health problems but are unsure if mold air purifiers will help. Others notice the moldy or musty smell in their homes but don't believe it causes health problems; they just want their indoor air to smell fresher and to have a clean home. What is the truth about mold? Is it a problem or a part of nature that we have to accept? If it is a problem, how serious of a problem is it, and is there anything to be done about it? Yes, mold is an aspect of nature and plays an important part in the decay of leaves and trees. So mold is good - outdoors! We know mold has a purpose in nature, but clearly molds inside of your home or workplace are not good. Airborne mold spores inside your home really become a problem when they land on wet surfaces. In a damp environment, mold spores rapidly reproduce; this causes humans discomfort and even illness. Mold particles are small enough to pass through the cilia in your sinuses and too small to be easily exhaled, so they can become lodged in your lung tissue. Larger particles, such as dust, are usually caught by the cilia before they enter the lungs. Some molds, called mycotoxins, are products of mold metabolism and potentially toxic. Allergic reactions to molds are generally in the form of runny noses, sneezing, red eyes, rashes, and symptoms commonly associated with cold or hay fever. The onset of symptoms is most often instant but sometimes may be delayed for hours. Asthmatic people may also have allergic reactions to mold. Infants, children, and the elderly can be more greatly affected by mold inhalation than healthy adults. Most mold spores range from 3-100 microns in size, but some can be as small as 1 micron. When looking at air purifiers that remove mold, it is important to invest in one that removes at least 3-micron size particulates or smaller. 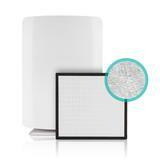 HEPA air purifiers are a terrific solution to remove mold spores from indoor air. In fact, our product experts specifically recommend HEPA air purifiers for this problem, and it is one of the best air purifier technologies offered to combat mold, on AirPurifiers.com. While you cannot rid your home entirely of mold, you can substantially reduce it. If your house is older, there is a greater potential for mold problems. Newer, tightly constructed homes that do not allow proper airflow can also be problematic. Office buildings are also often rife with mold. Smaller, visible areas of mold should be cleaned up with household cleaners and the areas dried. However, the mold is often not visible because it is in hidden places. The mold may reside on a surface but when the surface is disrupted, the spores become airborne and begin to cause problems for people. The spores generally settle down in time but whenever they are disrupted they take to the airflow again. That's where a continuously running or mold air purifiers can be of great assistance in getting a clean indoors. Mold air purifiers with HEPA filters are generally most effective at removing the airborne spores. Mold spores don't reproduce without moisture. When airborne mold spores are pulled into an air purifier, the HEPA filter traps them and they die. Mold does not reproduce in the filters since there is no moisture present in the air purifier. However, for those in damp environments where high humidity is a regular occurrence, using a filter treated with an antimicrobial can provide an added level of protection against mold growth on the filter. Whenever possible, remove the mold completely and take steps so that it does not return. If you cannot entirely remove the mold or even find it, you can quickly and easily remove the airborne spores with air purifiers designed for mold. If you allow mold spores to remain indoors and they subsequently land in a wet area, the process begins again with the growth of new mold. When possible, use a high quality HEPA mold air purifier to continually absorb the airborne spores. Such air purifiers are engineered to run 24/7 and actually work more efficiently when allowed to do so. Please be advised that extensive water damage that has resulted in the significant growth of mold may require removal by a licensed contractor. Mold spores range from 1-30 microns, and air purifiers remove mold as small as .003 microns. UV light is helpful but is not required for removing spores. UV requires certain intensity and sufficient contact time. Mold spores die inside the HEPA filter because it is a dry, sterile environment. A quality HEPA air purifier will remove airborne mold spores. If the mold is embedded and cannot be removed from a surface, an air purifier can help remove odors. Those in Damp Environments should use a purifier with antimicrobial filter to prevent mold growth on the filter.